If you have more than a passing interest in carpets then let Magic Carpet Travel help you design a trip to learn more about the art of Persian Tapestry. You can witness traditional methods of silk and wool preparation and the production of simple nomadic flat weaves woven in tents. In contrast, you can visit the immense vaulted carpet bazaars of the great cities and the elaborate silk carpet centers of the desert edge. As you travel in search of the perfect carpet, you could also take in magnificent Persepolis, the monumental capital of Isfahan, beautiful, poetic Shiraz and sun-baked Zoroastrian Yazd. In addition, you would wander somewhat off the beaten track to ancient caravanserai at the desert’s edge (Qom, Kashan, Natanz, Ardistan, Na’in and Kerman) while taking in some ravishing palaces, gardens and shrines against the backdrop of Persia’s stunning and diverse landscapes. London Tehran Depart from London Heathrow in the afternoon. Tehran Arrive early morning and transfer to hotel. Morning rest. After lunch, visit the Ethnographic Museum and Carpet Museum. Tehran Shiraz Morning visit to carpet section in Tehran’s main bazaar. Morning flight to Shiraz. In the afternoon, visit the workshops of nomadic rugs woven by those nomads who have settled in Shiraz, and a visit to the Shiraz carpet bazaar. ShirazPersepolisShiraz Morning visit to wind swept ruins of Persepolis. 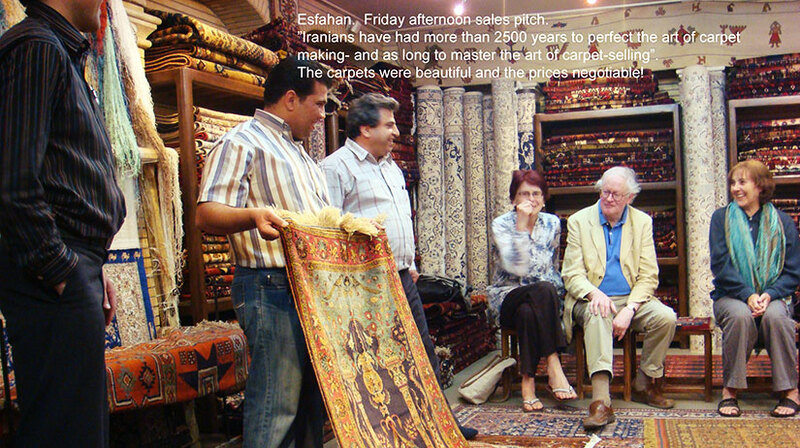 After lunch at Persepolis, return to Shiraz to visit the carpet weaving, dyeing, washing and repairing workshops. Shiraz Firuzabad Drive south to Firuzabad. On the way, visit Qashqaii nomad tents with their carpet weaving & other handicrafts. Onto the Sassanian palace at Firuzabad & other antiquities. Firuzabad Kerman Drive to Kerman via Sarvestan and Sirjan. Visit more nomads on the way, as well as the Sassanian ruins at Sarvestan. Kerman Visit the main centers of the weaving industry in Kerman: Iran Carpet Company, together with workshops for kilims, jajim, suzani, etc. Visit toso the bazaar and Friday Mosque. Kerman Mahan Kerman Excursion to Mahan and Jupar. In Mahan visit the Shahzadeh Gardens and the Shrine of Nimatullah Vali, as well as small carpet workshops. In and around Jupar visit some of the small village weaving centres. Kerman Yazd Drive to Yazd in the morning. After lunch, visit Ziloo, Terineh (brocade) and other weaving centers of Yazd, together with the Friday Mosque. Yazd Isfahan Leave Yazd in the morning for Isfahan. On the way visit the Ziloo Museum and pottery workshops in Maybod, silk carpet weaving workshops in Na’in, and Abba (camel hair) weaving workshops in Muhammadiyah. Isfahan In the morning, attend some training classes in carpet weaving. In the afternoon, visit the carpet pattern and dyed wool workshops, as well as the carpet bazaar. Isfahan Full day sightseeing in Isfahan: Royal Square, Ali Qapu Palace etc. Isfahan Day excursion out to the Bakhtiari nomad encampments west of Isfahan. Isfahan Tehran Drive to Tehran. On the way, visit the mosques in Ardistan and Natanz, as well as silk carpet workshops in Kashan and Qom. Tehran London Depart from Tehran early morning arriving London Heathrow around midday. There are no set dates for this tour, which we can arrange on a tailor made basis to suit your individual requirements.